Olympic National Park welcomes you to a diverse and stunning world, ranging from the fog-shrouded coast where booming surf pounds onto sandy beaches to spectacular alpine country dotted with sparkling lakes, lush meadows, glaciers, and North America's finest rain forest. Olympic is a wilderness park, with much of its interior accessible only by trail. 99% of the park is designated as wilderness. 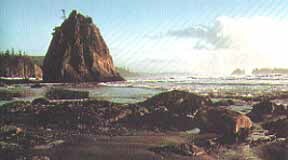 In 1938, President Franklin Roosevelt signed legislation creating Olympic National Park. Visitor centers are located at Port Angeles and at the Hoh Rain Forest. Both have exhibits, publications, and staff members to answer your questions. The park contains about 1,000,000 acres.